Robert Zimmerman Ba Ba Ha Ha is back! 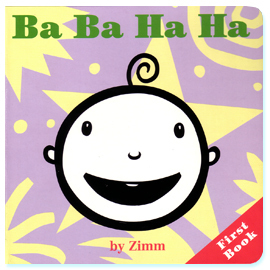 In 1996, Harper Collins published a little board book that I did for babies and toddlers called Ba Ba Ha Ha. One year later, after selling about 20,000 of them, Harper decided that printing board books was too expensive and took the book out of print. In the years since, I have received hundreds of letters, emails and even phone calls asking if the book was still available. All I could do was refer them to Amazon, where "slightly chewed" copies were selling at prices of over $100. Earlier this year I decided I was finally going to do something about the situation, take matters into my own hands you might say. dada ba beeeb wah de ba da wee weeeeee! It's BAAAAACK! PS: I hardly chewed my copy at all! Interesting reading about the process you went through to get this book out. The big, fancy publishers don't always know what's best for the reading public. Was Harper Collins cooperative at all in at least looking for the original layouts and type specs? Do they still have any copyrights to the book? I admire your determination to get it back into print. I'm gonna see if I have any far-flung relatives or friends who just had a baby to send them a copy. Good luck! The book had to be completely redone from scratch, although I still had the original drawings. Honestly, the drawings don't really do much for me. I wish they were better...but I felt I had to make exactly the same book as the original...because there's just something about this little thing that toddlers love. I don't really understand it myself. The process of getting the rights reverted back to me was quite simple. Just an exchange of letters. I'm sitting here watching orders bounce in one after another! This is amazing! I'm a publisher! AGGGGGHHHHHH!!!!!!! Thanks everyone! Dear Zimm Conglomerate Worldwide Industries, Congratulations! There will be lots of happy kids and parents out there. The process was an interesting read. GOOD LUCK! Zimm congratulations! fun to read the whole story.